I'd say I'm the spendthrift this Sunday! Definitely the Guess bag, it also looks bigger, which I like. Definitely would go for the GUESS bag. Both are really adorable though. I love studs. It would be so cool to have the real thing. But I don't know where I could show it off. I've gotta admit I like the Rebecca Minkoff better. Yay! I was thinking about a good cross body bag for stylish vacations and I was worried that I wouldn't find one. But you found one for me! I love it- the cheaper one is calling my name! I'm not a fan of studded bags anymore,but I'll always go for true leather. What a cute bag! I love both versions! Spendthrift - I heart RM bags! Couldn't get enough of them if I tried. I hate faux leather so I would have to go with the Rebecca Minkoff one. J Crew also has a cute studded bag on their website that isn't too pricey. I like them both, but I like the Guess one better. I'm always up for the spendthrift. So, therefore, GUESS. I hope you're having a great Sunday. I actually prefer the Rebecca Minkoff bag. the guess bag for sure! they're both cute!! Oh..such a hard choice..but I always go for the cheaper one. 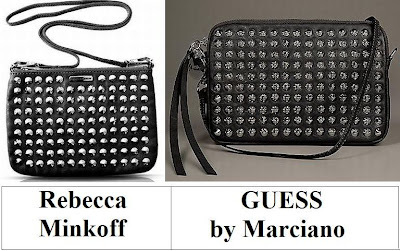 I would have to say the Guess bag, although both are gorgeous! I'd definitely go with the Guess bag! Yes, I have to agree, I would go with the Guess bag. Everything I've bought from Guess is high-quality and lasts forever! I'll definitely go for the Rebecca Minkoff! I'm going for the Minkoff. It is such a cute, yet edgy, little bag. I need to own it. Both are lovely, but I'm going to have to go with the Guess bag. i love. that you love. gossip girl. The real thing is just so cool..but I'd be OK with the thrifty choice. awww... the rebecca minkoff is adorable..
i'll look stunning with it.. I was actually going to buy the Rebecca Minkoff one, but the Guess is really cute so good thing I didn't! No thrift.... Maybe in 10 more pounds then I'll treat myself. Great find. Thats one of the things I am buying now, bags. No pounds lost needed. That Minkoff is STUNNING, but for a trendier item I must go with the saver one! OOh I love this find! Definitely go for the save!! I do love both versions. So ultra cool. Hope you had a great weekend. I prefer the Rebecca Minkoff bag. I gotta go with RM on this one! With bags, I think I've come to the unfortunate conclusion that thrifty is never the better option. Expensive bags are generally higher quality and made of leather. Plus something you use regularly... worth it! I'm going to have to splurge on this one! Gorgeous bag. I'd go with splurge now. 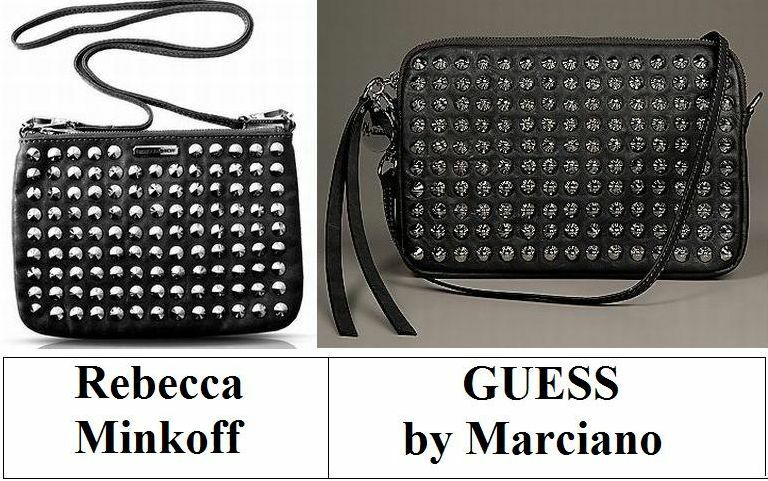 They both look pretty different, and the Rebecca Minkoff one is way more chic.